During the decade following the important 1888 General Conference session in Minneapolis, Minnesota, Ellen White wrote a number of vital messages to church leader in Battle Creek and elsewhere. These messages called for regeneration and reformation of life, affirmed God?s leading of His church, urged everyone to follow more closely the principles of God?s Word, and set forth the importance of developing a personal relationship with Jesus Christ as Savior and Lord. After these messages had been read by the original recipients, many were printed in tract form. In 1923 a representative selection of these special messages was published as Testimonies to Ministers and Gospel Workers. 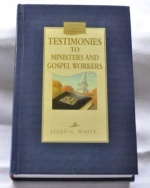 Though many years have passed since Ellen White first wrote these testimonies, they still probe the heart, stir the soul, and point to God?s love and Christ power to save the uttermost.